"To spark a passion for life long leraning" We will accomplish our mission by providing a place where children are encouraged to think for themselves, expand their problem-solving abilities through creative exploration and exercise both their bodies and their minds. The Sacramento Children’s Museum (SCM) was founded in 2004. It is the vision of a local mom, Kathleen Palley, who saw the need for inspiring learning through interactivity. The SCM seeks to build an environment that makes learning exciting and enriching for children and their families through exploration and hands-on activities. The desire in Sacramento to build a children's museum was so great, that the organization quickly grew to include local business-people, children's advocates, educators, physicians, attorneys, librarians, and others. As a group, we embarked on a journey to determine how we could best meet the needs of the children 0-8 years of age, in our community, and the Sacramento Children's Museum is the result. There are currently twelve members on the SCM's board of directors, as well as ten advisory board members. The Sacramento Children’s Museum is a non-profit corporation. The Sacramento Children’s Museum strongly believes that play is an essential part of a child’s "work." Imaginative, hands-on environments provide children with a gateway for opening up their minds to developing new abilities, building confidence, and making connections between their dreams and their real world experiences. 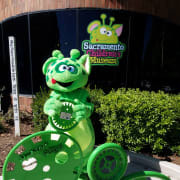 Would you recommend Sacramento Children's Museum?